My Jump Freighter is a workhorse. I probably spend more time in it than any other ship. 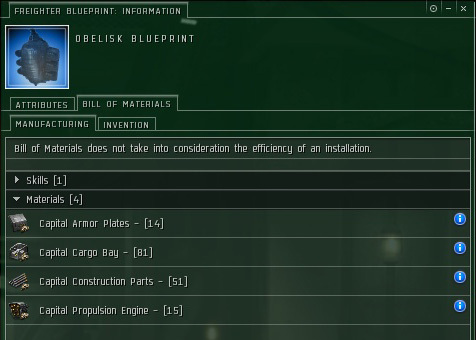 Ships, ammo, POS modules, POS fuel, minerals, and salvage all need to be moved around in nullsec. 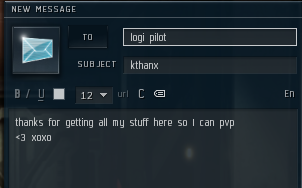 Please take a moment and send a thank you evemail to the Logistical pilots in your corp/alliance. A few month ago, I set out to reduce the Isotope cost as much as possible. One way on the round-trip into our nullsec staging system was consuming 21.2 k Isotopes with level 4 skills. By polishing them off to V, the consumption is now 14.7 k.
What’s the cost difference? 10.6 M vs 7.36 M, so about 3.24 M saved per one way run. Pocket change aye? But given that I was doing 5 round trips a week, that’s 32.4 M a week or 130 M a month. If you are in a phase of setting up or ripping down lots of towers, the number of jumps can be huge. The two skills that affect Isotope consumption are Jump Fuel Conservation and Jump Freighters. Jump Fuel Conservation – 10% reduction in ice consumption amount for jump drive operation per light year per skill level. As far as maneuverability, don’t forget the wonderful Hardwiring – Eifyr and Co. ‘Rogue’ CY-1 and AY-1 implants. While listening to Voices from the Void Episode 13 podcast, the topic of Hybrid balancing was brought up and I agree completely with what they stated about them. Blasters do insane amounts of damage… if you are 7.5k or closer to the target ship. Rails do moderate amounts… as long as your target is not moving. I don’t hate Gallente, I just hate the subcapital non-drone dependent ships due to their reliance on Hybrids for DPS. The drone dependent ships such as the Ishkur, Ishtar, and especially the Thanatos rock and I love flying them. 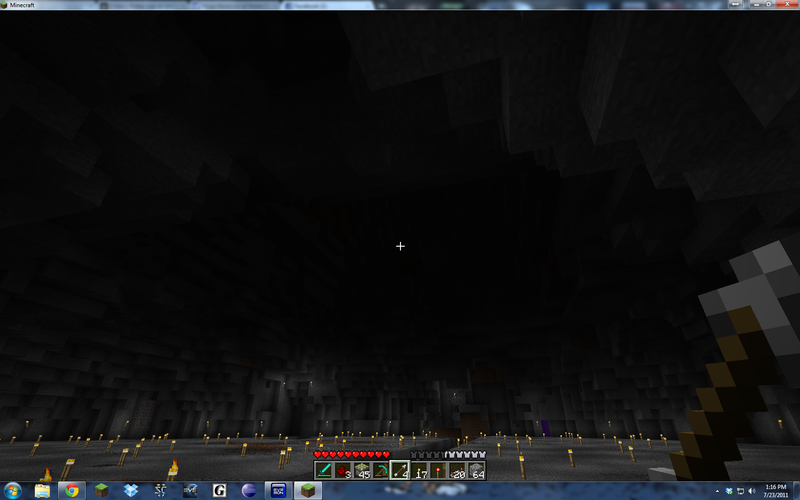 Oh dear how did Exhumers get in there! My mouth has been watering for a Strategic Cruiser for a while now and I just couldn’t justify the Proteus as a PVE ship (though seeing them melt ships at point blank range in AT9 was a-mazing). Scorch Legion? meh. Loki? Now that’s a nice PVP ship if you have the ISK to put on the line. 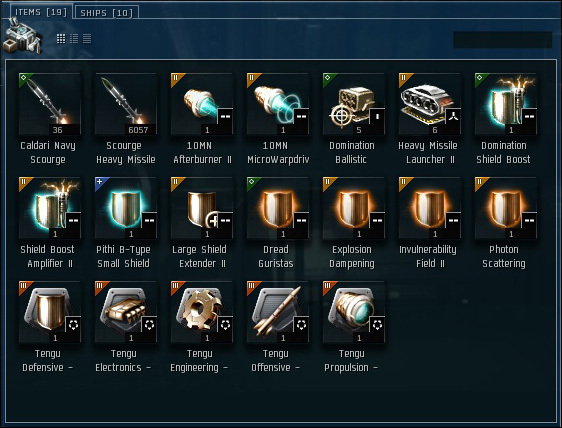 The agreed upon standard for running missions and sites in nullsec is the mightly Tengu. After rounding out some *sigh* shield and missile skills, I bought some goods. Here’s the general PVE fit that I got from a friend. 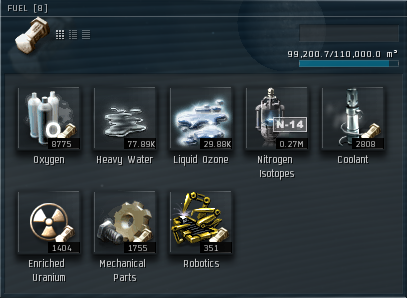 I might change out some of the items for higher Meta items since I have some spare ISK. One of the popular items that I sell has been slowly dropping in price due to an influx of new traders. 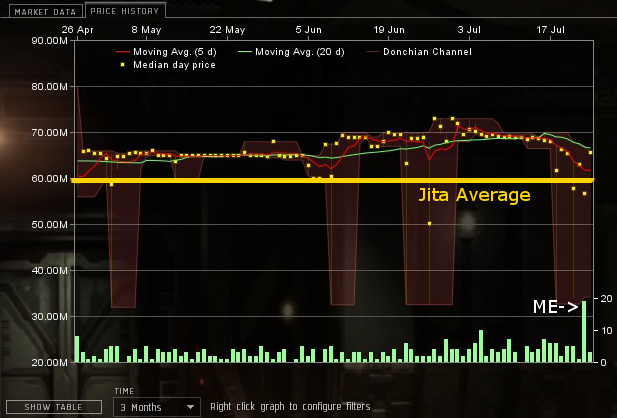 The Jita average is about 58-59 M. Over the week, the price slowly fell below Jita prices to around 57 M.
Buyout time! I dropped 619 M and bought up the stock that was below Jita prices and reset the price to 65 M.
I’m making about 8 M per unit so I expect about 88 M of profit for all of the units. My advice to traders is to not be afraid to sink money into an item and reset the price. If there is sufficient movement, do it. While working on some profit numbers for various items, I found that ME levels affect the build costs a little differently for Capital ships than other items such as Battleships or Modules. A simple example is a battleship like the Maelstrom. For every additional ME level, the material requirements level off. Less Tritanium, Pyerite, Isogen, etc. are required for each additional ME level. 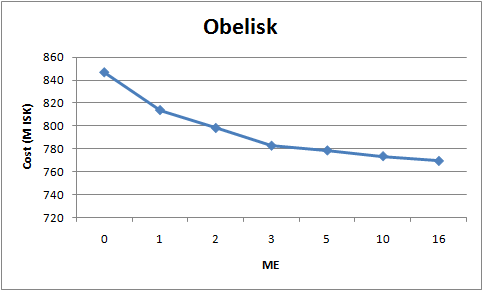 There is a diminishing return with each ME level as it is a logarithmic trend. 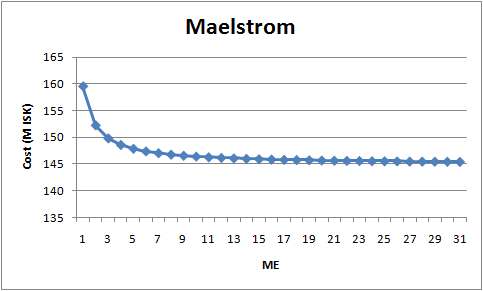 For a Maelstrom the ‘optimal’ ME is around 15, which is about 2 months worth of research. Capitals however, are made from Capital Components which are made from minerals. The material requirements for the Obelisk only change at ME 1, 2, 3, 5, 10, 16, and so on. You don’t get any benefit by researching a Obelisk BPO to ME4. You might as well get it to 5 to remove another Capital Component from the requirements. I have found the ME charts on games.chruker.dk to be invaluable for this type of information. 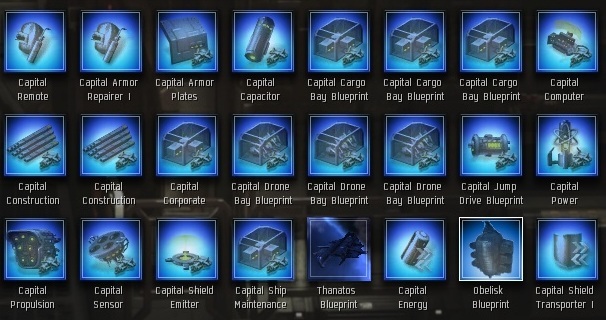 Over the past three months, I bought up some Capital BPOs because I wanted to cut the costs of producing my own Thanatos and Obelisk ships. After a few successful sales, hauling all the lowend minerals around got a little tiresome. One Carrier build takes about 2.34 Freighter runs of minerals, whew. If you have ever piloted a Freighter, you know how terribly slow they are to align and warp. A fellow blogger has a good post about producing Capitals (http://eve-fail.blogspot.com/2011/07/what-im-doing-now.html). I want to take a different direction. I’ve always wanted to run my own research POS so I ran some numbers and figured out that making copies of the BPOs will net around a 657.8 M profit/month. Copying the Carrier and Freighter BPOs will be considered extra profits. The key will be to finding a quiet lowsec system with a station. Also, I will have to install a corp office in the system so that the BPOs will be kept in a station and never be contained within a lab in a vulnerable POS. Consume fuel such Coolant, Enriched Uranium, Racial Isotopes, Mechanical Parts, Oxygen, Robotics. These ships are huge and don’t dock. How are they so self-sustaining? If you expand this idea, perhaps even require some Water and Foodstuffs for them to run. I also think it would be neat if they needed to be stocked with crew such as Civilians, Slaves (Amarr), Janitors, and Marines. 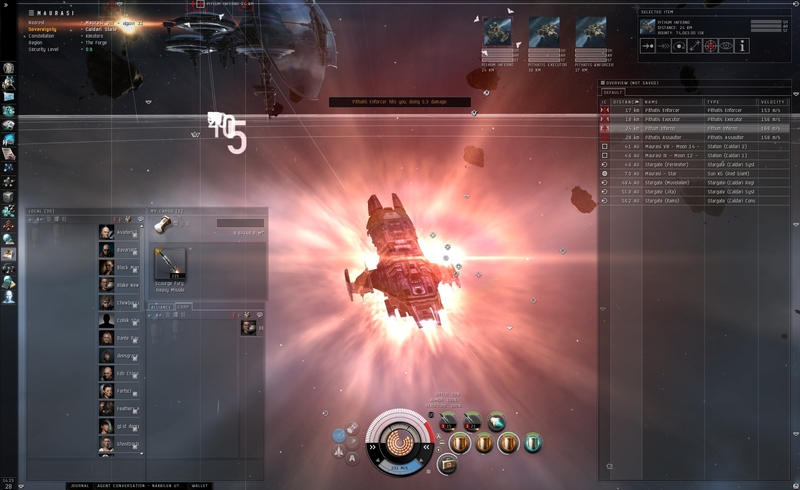 Creating the ability to disable a specific gun, module, or Jump Drive on capitals would change combat. Smaller than a Carrier/Dread ship that can go into Siege and get a bonus for taking out Fighter/Bombers. We’ve been asking for this one for a while and I can’t imagine the change would be all that hard. 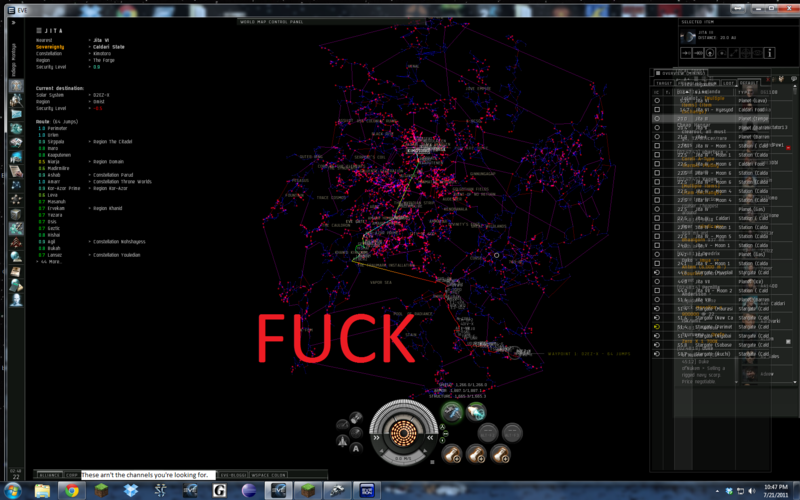 Right now if you want to have industry in nullsec, you need to put up a few Stations across the constellation. If you could concentrate services into one system, I feel that you could really create a seance of a “home system” for industrial operations. Perhaps an additional timer after you have destroyed all the station services? Having lived in wormhole space for over 6 months I can tell you that getting items in and out is a logistical challenge. I don’t think that ABC ores should be entirely removed from lower class wormholes such as C1-C3s, but rather that their amount reduced. I loved that Pirate and Navy ships have been added to the Market. I would like to see the other modules added. There should be a type of indicator added to the Tactical Overlay that shows additional information such as your optimal and falloff.